I have partnered with Flatout to create these Apple Cheddar Turkey Wraps. I have been compensated for my time commitment to work with their product, however my opinions are entirely my own and I have not been paid to publish positive comments. 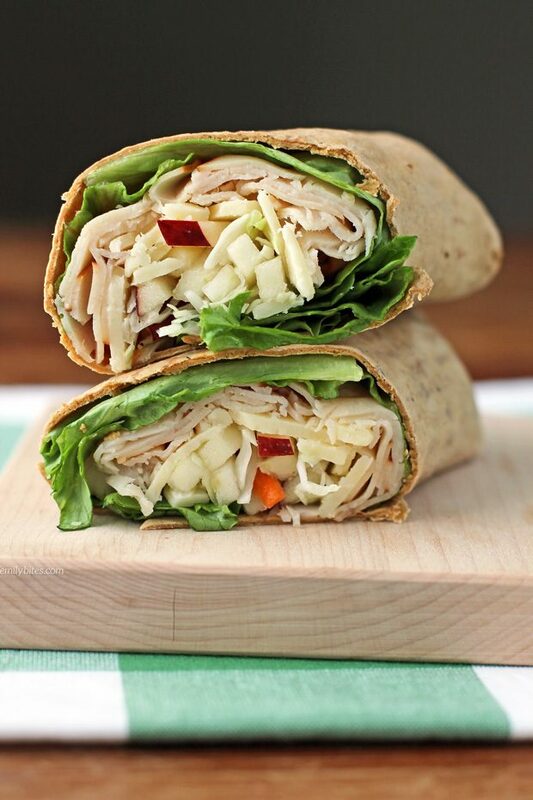 These Apple Cheddar Turkey Wraps are such a simple, tasty way to elevate your lunch game. It’s easy to get stuck in a lunch rut, but tossing together a quick apple slaw and wrapping it up in a Light Original Flatout flatbread takes a standard turkey sandwich to the next level. I love making wraps for lunch because it always makes me feel like I am eating from a restaurant. They just seem fancier than sandwiches (though I of course love those too!). 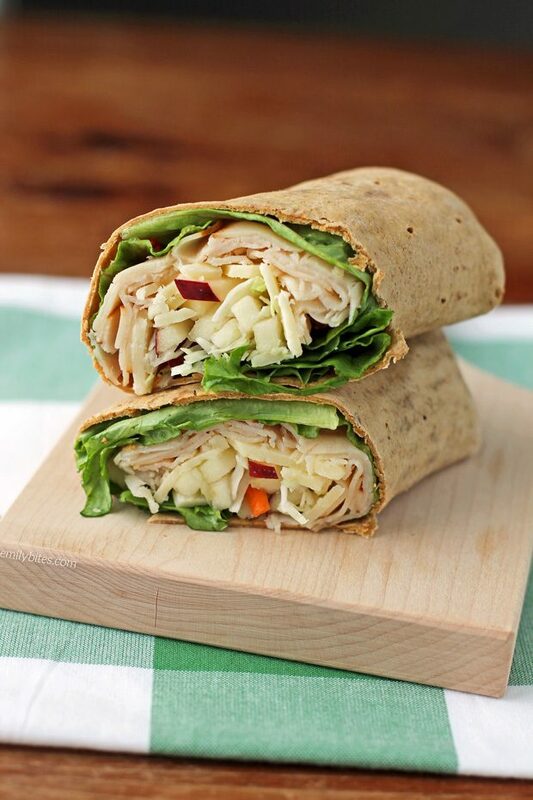 I love how easy these Apple Cheddar Turkey Wraps are to put together, and I think you’ll also love that they’re each only 277 calories or 7 Weight Watchers SmartPoints. I found a wrap to be really filling, perfect to help keep you full until dinner. As many of you know, I have worked with Flatout for quite a while now and I never tire of gushing about their products. The Light Original Flatbreads are one of my favorites because they taste great, they’re super versatile for wraps or pizzas and they’re so easy to fit into a healthy lifestyle. Each one is only 90 calories and packs 8 grams of fiber and 9 grams of protein. That’s a great nutritional place to start before you even add any toppings or filling! Looking to see what other recipes I’ve made using Flatouts? Check out my Turkey Cranberry Flatbreads, Savory Sausage Pumpkin Flatbreads, Chicken Caesar Wraps, Veggie Lover’s Flatbread, Black and Blue Steak Wraps, Easy Taco Cups, Spicy Southwest Chicken Wraps, Peaches and Cream Dessert Flats, Three Cheese Mushroom Flatbreads, Maple Bacon Breakfast Wraps, Chicken Saltimbocca Sandwiches, Buffalo Chicken Pinwheel Wraps, Spinach Artichoke Flatbreads, Greek Snack Flats, Mexi Burgers with Guacamole, Chinese Chicken Wrap, Chicken Pesto Flatbreads and Bacon Cheeseburger Wraps! In a small mixing bowl, combine the vinegar, oil, honey, salt and pepper and stir until well combined. Add the apples and coleslaw and stir to coat. Lay the apple/coleslaw mixture on top of the other ingredients layered on the wrap. Fold in the rounded ends of the flatbread over the filling. Then fold one of the long edges over the filling and continue to roll until the wrap is completely rolled up. Cut in half and serve. This looks SO delicious. I always forget how delicious apple and cheddar go together! Would this be okay to make the night before? Made this for lunch this week was DELICIOUS!! My husband said restaurant quality : ). Yay, I’m glad they were a hit! This is one of my favorite go to recipes but most of the time I make it as a big salad bc I have celiac and the gluten free wraps seem to have more points and really aren’t as good. It’s great as a salad!!!! Made this tonight with just a couple changes due to ingredients on-hand. Hubs wanted to “grill something” so he cooked up a boneless, skinless chicken breast and I chopped that up instead of deli turkey. Didn’t have some of the dressing ingredients but had store-bought apple cider vinaigrette. Overall, this is an excellent and very adaptable recipe, and we both agree it’s going in to our lunch and dinner rotations! Thanks so much!